Nigel—Montgomery’s godbrother—at Precious Blood Ministry of Reconciliation holding up pictures of Montgomery (Photo: Davon Clark). By Sajedah Al-Khzaleh and Bia Medious. More men have been exonerated in the ongoing Ronald Watts corruption scandal. We spoke with a wrongful-convictions attorney who’s working the case. Last week, 18 men who were wrongfully convicted of crimes linked to corrupt former Chicago police Sgt. Ronald Watts had their cases overturned. Joshua Tepfer represented 12 of them. As part of a reporting project about how incarcerated people fight their convictions, City Bureau spoke with Tepfer, an attorney with the Exoneration Project – a legal service organization that reinvestigates cases of individuals who claim that they were wrongfully convicted. Since 1989, 2,240 people in America have been wrongly convicted of crimes and then later exonerated and cleared of all wrongdoing due to new evidence of innocence. Illinois ranks No. 3 on the list, with 225 exonerations in the past nearly 30 years. That’s according to the National Registry of Exonerations, which counted 20 men and one woman in Illinois who were exonerated in 2017 from the crimes of murder, sexual assault, drug possession and robbery. 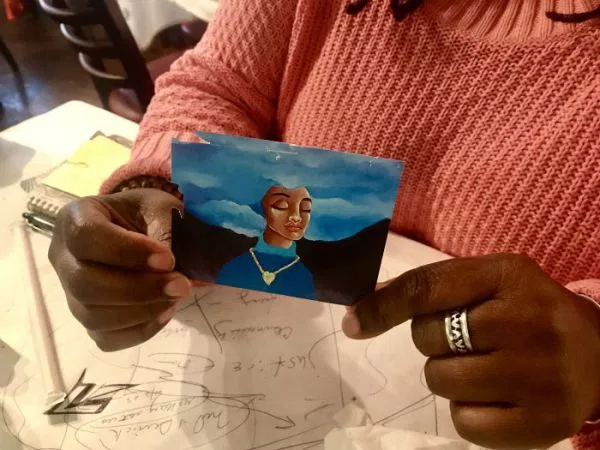 Earlier this year, Tepfer sat down with City Bureau to discuss racial bias and police misconduct in the criminal justice system, as well as how individuals and their families cope with the emotional and material impact of wrongful convictions. Information from this interview, as well as dozens of other interviews and extensive research, is compiled into a zine: “After the Trial: A Legal Toolkit for Prisoners and Their Loved Ones.” If you would like a free copy, please go to http://www.citybureau.org/afterthetrial. According to the National Registry of Exonerations, Illinois consistently ranks in the top two or three states for exonerations each year. Can you explain what led to this? Sometimes the criminal justice system gets it wrong. Illinois has a lot of wrongful convictions. Chicago’s got a lot of wrongful convictions. One of the reasons is we have one of the most active post-conviction litigation bars. I work at the Exoneration Project. There’s another organization called The Center on Wrongful Convictions, where I used to work. There’s another organization called the Illinois Innocence Project, that’s downstate. That’s pretty rare for a state to have this many groups working on these types of issues. The second reason, of course, is the horrible history of police misconduct that we have in Chicago. It’s led to an extraordinary amount of wrongful convictions. Have you worked on any cases involving police misconduct? African Americans make up 13 percent of the American population but are 47 percent of the exonerations. What leads to racial disparities? Racial bias infringes on every aspect [of the criminal justice system] because the system is made up of individual actors – prosecutors, judges, police officers, defense attorneys. Individuals come with their own flaws. As we know, many people have their own biases whether it’s explicit racism or implicit bias. Bigger picture, the flaws are at every level. Incarceration is disproportionately Black and Brown people. There’s a problem with how police conduct searches and investigate crimes and make arrests. And then of course, the oversentencing problem is huge. Nowhere do you see that more than in drug crimes. It’s well documented. [White] kids who experiment in college with drugs are not prosecuted, whereas Black, Brown or urban youth who are experimenting in the same way are sent away for very, very long periods of time. Needless to say, when you are overprosecuting Black and Brown people as a whole, you’re going to see disproportionate wrongful convictions from those individuals as well. What was it like working with the families of those who were wrongfully convicted? It’s always difficult to go back to court and to go through this process. But they’ve been living with [the conviction] a lot longer than I have, and they’re the ones who know that their son or loved one or themselves is innocent. Usually they’re heartened that somebody is fighting for them and bringing it back to court. It gives them some hope. The alternative is they’re fighting it on their own in an unfamiliar system, in a system that already wrongfully convicted them, in a system that they’re not trained to fight in, in a system that is not going to take untrained lawyers, or loved ones advocating on their behalf, seriously. Some people remain in prison for 10 or more years before their innocence is proven. What does a person lose when wrongfully convicted? What have your clients lost? Well, it’s brutal. They’re taken out of society for a significant period of time. They lost time with their family. Loved ones die. Loved ones can’t always stick by them or they lose touch with them. They are unemployable because they don’t have job skills. Lots of times they are very, very young, like high school age, when they were wrongfully convicted, or younger. They don’t have education. They suffer from violence in the prison system from correctional officers and other inmates. Many times they are hardened. They have significant Post Traumatic Stress Disorder when they’re released. Are folks who are wrongfully convicted compensated in Illinois? They can be. There’s a statute called the Certificate of Innocence and if you’re certified innocent, you can then petition for state statutory compensation. But it takes a long time. It’s not automatic. Some of them are more successful than others. I have a client who never got the money for three years because the state wouldn’t pass a budget. The process to exoneration seems really difficult. Have you been more successful than you expected? You know, the successes are wonderful but the losses stick with you more. I’ve had a lot of success. I’m proud of that. I’m super happy for my clients especially in the last year or two – I’ve had more success than I probably ever envisioned in some of these cases. But I still have clients who I firmly believe in who are still sitting in prison. So, I think of them more often than I think of the wins. We spoke with the head of Cook County’s alternative court system to find out more about how they divert people from jail and decrease incarceration rates. Though the vast majority of Cook County’s criminal cases are tried in criminal courts, the county also has a substantial “alternative” court system—or courts that aim to rehabilitate defendants rather than sending them straight to jail. Nineteen problem-solving courts have been established throughout the county since 1998. 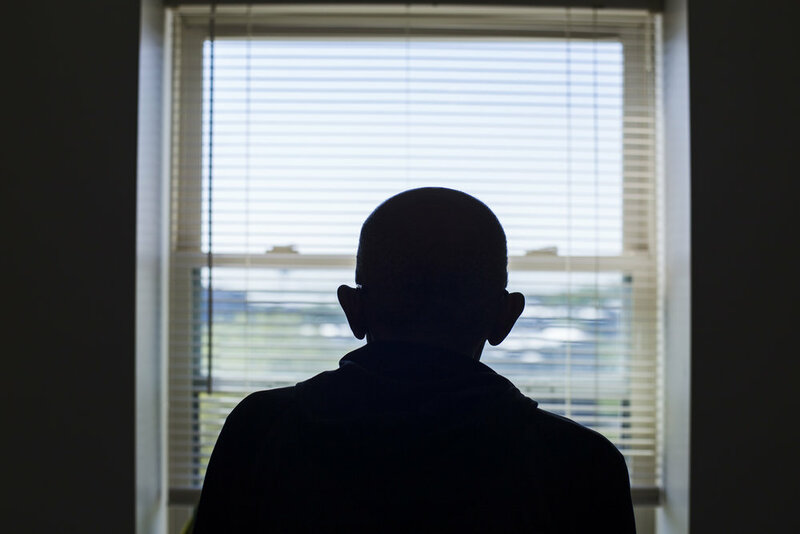 Courts dedicated to specific populations such as those with mental illness, drug dependency and veterans offer alternative sentencing options that keep the mostly nonviolent defendants from returning to jail through treatment programs and intensive supervision. In 2011, the county took another approach by establishing deferred prosecution programs aimed at helping low-level offenders before a conviction is placed on their records. Emily Cole leads the Alternative Prosecution and Sentencing Unit inside of the Cook County State’s Attorney’s Office. She began her career as a prosecutor with the office in 1998 and has spent the last 17 years in this type of work. City Bureau met with Cole at the Leighton Criminal Court Building, in her 14th-floor corner office that overlooks most of the Chicago skyline. Surrounded by volumes of books on everything from Illinois statutes to reference guides on searches, Cole shared information about the programs and how access to them can be increased. What are the deferred prosecution and alternative sentencing programs? Deferred Prosecution happens pre-plea [or before conviction]. Alternative sentencing, which is basically the Problem-Solving Courts, happens post-plea [or after conviction]. Problem-Solving Courts handle felony cases, while Deferred Prosecution programs handle both misdemeanors and felonies. When we defer the prosecution of a case, as long as the individual -who is the defendant, but is called the participant— does whatever is dictated by that particular court, then the State’s Attorney’s Office dismisses the case. People who are at low- and moderate-risk at re-offending, and those who are low-need, typically go into a Deferred Prosecution court, whereas high-risk, high-need individuals go into the Problem-Solving Courts. All of the offenses have to be probationable. Illinois statute actually enumerates the specific crimes that are ineligible. Reducing recidivism [or the rate at which defendants commit new crimes after they’re released] and any sort of reconnecting individuals back into the community would be the main benefit of the programs. Getting a job, going to school, being better role models for their kids, maybe avoiding a case over in juvenile court with their children… I mean, it’s got the trickle-down effect. You can see the trend—in this office, across the United States and even internationally—that this is a cost-savings benefit as well. And it’s absolutely the right thing to do for individuals who are nonviolent to have this type of approach versus being in and out of the criminal justice system their whole life. So our office actively looks for cases. We have dedicated assistant state’s attorneys who sit downstairs near bond court and screen every case. Public defenders and attorneys also make referrals. Sometimes parents or family members call. I just had a grandmother call me last week about her granddaughter. A case comes to our attention, we review it, we determine if they are statutorily eligible, we reach out to the victim and then the participant has to agree to it. This is because the problem-solving courts are much more rigorous than regular probation. It’s a team approach. In drug court, participants typically get an assessment that’s almost always followed by inpatient treatment and then outpatient treatment. From there, they go to a recovery home and then to a job training or educational program. The mental health and veteran’s courts follow similar paths. How can access to deferred prosecution and alternative sentencing programs be increased? We can always use more assistant state’s attorneys. There are currently 15 in my unit working at all of the district courthouses, but not every day. Everyone in my office should know about these programs, but having someone in court every day who knows the programs really well would be better. Also, we could definitely use more funds. The state’s attorney’s office doesn’t charge anyone to go through deferred prosecution programs because that would mean those who had money could defer their cases and not those who didn’t. So we link up with treatment providers that have the resources to figure out how to get reimbursed. So while money may not help with volume, because people still have to qualify, it would probably affect the success rate of the programs. There are things like recovery homes that aren’t covered by CountyCare or Medicaid. We’re always looking for referrals for participants to get into any of these programs. Another example is when inpatient stays are covered, they are usually shorter than we would prefer. Getting the word out about these programs is another way access can be increased. I can only do so much training myself, and that’s done with state’s attorneys, public defenders, bar associations, the sheriff’s office, the Chicago Police Department and at a variety of speaking engagements. Occasionally, you will see a success story in the newspaper. We spoke with musician and educator Rashida Phillips to learn about how the School is evolving, what the role means for her and her family and how she defines Black generational wealth. This year the Old Town School of Folk Music, the nation’s largest community arts school, celebrates its first-ever deputy director, Rashida Phillips. The St. Louis native has spent the last 15 years working in Chicago’s cultural and educational sectors and performing at jazz venues across the city. Phillips says she joins during a significant period of change for the 61-year-old institution. She hopes it’ll mark a time when the “folk” at Old Town School of Folk Music will be more inclusive—reflective of Chicago’s vast musical history as well as its people. Phillips shared what her new position means for Old Town, the Chicago art scene and her family. The conversation has been edited for length and clarity. Can you talk about your role as the school’s first deputy director? I work primarily with the education programs: community initiatives and operations and school-wide initiatives. The responsibility for me is to think about the enrollment of the future, what those future populations [of students] look like, and coming to ourselves in terms of moving out of a “folk” label. Some people feel like it’s just banjos and guitars, and they don’t understand what folk means. We started the Teen Collective program that’s growing. We know that Chicago has an active community of young folks, so if we don’t change, they’re gonna change it for us. That’s for sure. What are a few of your goals for this new position? We have initiatives that are happening here on [our Lincoln Square] campus. 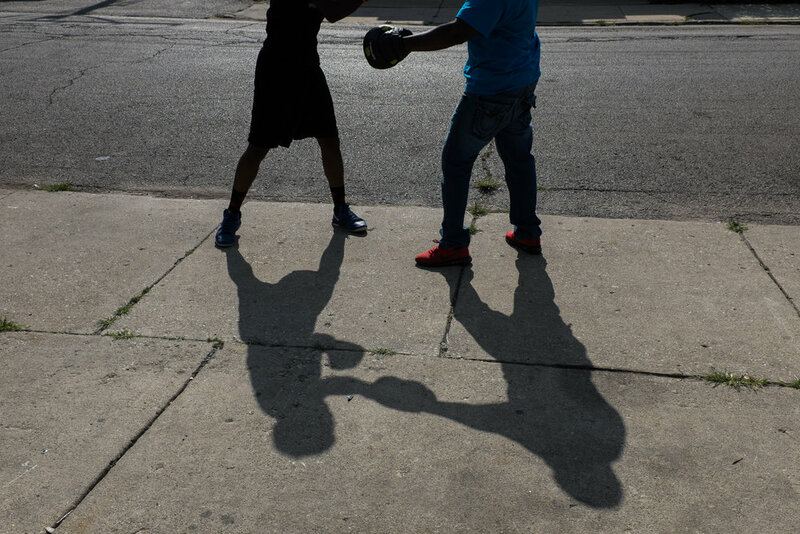 We have a lot of these programs building in North Lawndale and Englewood and its surrounding South Side communities, around arts and community wellness, and that programming is still in its infancy. What we’re trying to do in those neighborhoods is help smaller, grassroots organizations build capacity, number one, and bring in resources to those communities. That means maybe musical instruments, some funding, shared knowledge of development strategies, instruction in arts and music and supporting professional development and job opportunities. We are supporting some of their ideas around community health and community wellness. We’re really trying to avoid this trickle-down scenario where you have larger arts organizations just handing out the remnants to the Brown and Black community. Coming into this position, I specifically said I don’t want to “other” those initiatives. We shouldn’t think of them as these alternative programs, these programs way across the city that don’t have anything to do with our programming here on the North Side. We really want to work on being the authentic partner. What’s the department culture like here? We’ve been around for 61 years and we were really seeded here not only in the folk movement but in the Civil Rights Movement. “We Shall Overcome” came out of here. Mahalia Jackson was here in the early days working, and they were documenting music of hers. We had a lot of folks coming together with that justice mentality of that time. I’m hoping that we can infuse that in our programming a little bit more because that’s the pulse of this city. What led you to this position? Tell us about your journey. I had always really been engrossed in music and came out of parents that educated me on what Black culture looked like and the power of Black people historically. Jazz is what spoke to me in my heart. In high school I started singing jazz and really just found a power in it through stories and storytelling. Coming out of Oberlin [College], my undergrad, one of the first colleges to educate women and Black people, there was always that consciousness in place. I’ve always been interested in the intersection of arts, of education, of history. I found myself in a place that supported the stories of young people, the Chicago Children’s Museum. Then I worked at Chicago Arts Partnerships in Education, where we looked at arts integration into school curriculum. I think the youth now are so much more ahead of that game than I was at that time. [Art is] the medium in which they express themselves and communicate their life interests. I had a mom who was a high school teacher and she said, “I always loved high school because they always kept me young, they always kept me hip.” I get that, so I’ve tried to follow that pathway in providing opportunities for young people to find their voice. I’m most proud of getting to this point. I promised myself that getting into these upper positions, I would be my most authentic self. In the interviewing process, the executive director had said something like, “Why now? Why is it important?” and I said, “You know what? It’s my time. Particularly it’s time for the Black woman. We have put the elbow grease in. We have helped folks through. It’s our turn to step into the spotlight and not just support people and hold folks up, but really take the reins because we’ve earned it.” And I said to him, “I feel like I’ve earned it at this point. And I feel like a lot of Black and Brown people and Black and Brown women have the right to be at the helm of these institutions.” So I felt proud in being able to take that on. 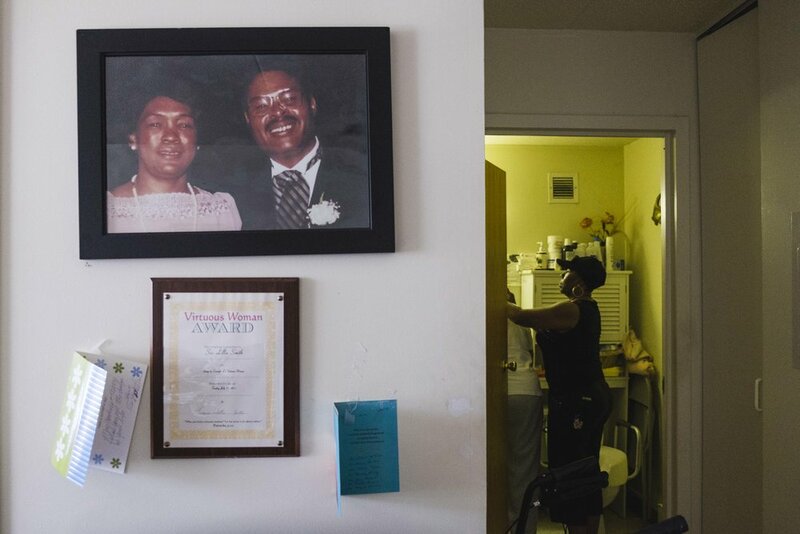 This summer at City Bureau, we’re looking into stories about Black generational wealth in Chicago; how it’s gained, lost and passed to the next generation. How do you define Black wealth for yourself? We got a lot of wealth just because we are rooted in ourselves. That’s the advantage that we need to take into consideration beyond the money. And the money is an issue, but the wealth of our culture is so rich. I think sometimes we need to lean into that a little bit more and support each other in terms of our communities. That’s really where our wealth lies. Because we don’t have the legacy of wealth that some of these billionaires have, we gotta think about wealth differently in our community and in our society. So my wealth is having my children be proud of me, having the opportunities that I can help provide for them and for each other. That’s what I consider wealth. How do you define Black wealth? This summer we’re collecting stories of Black Chicagoans and compiling a holistic picture of Black generational wealth. You can contribute by emailing blackchiwealth@gmail.com or using the hashtag #BlackChiWealth on social media. 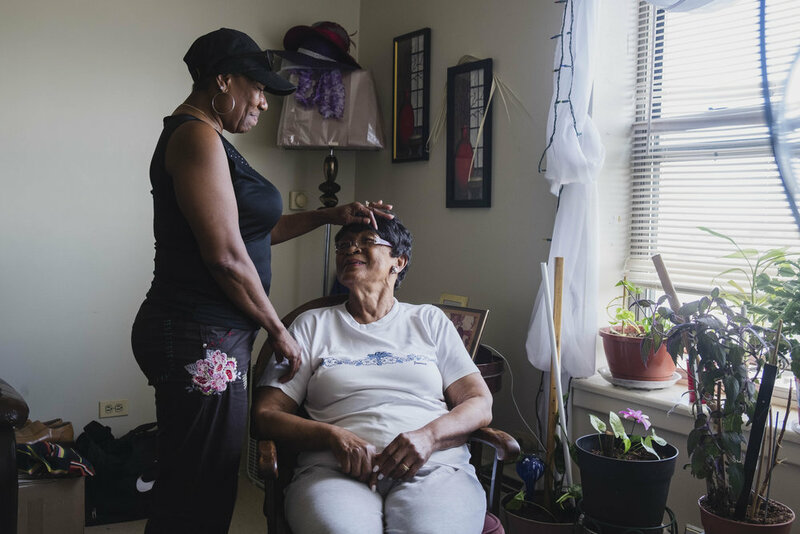 From Auburn Gresham to Hyde Park, seniors and their allies are doing whatever it takes to combat social isolation and other issues of aging. Older adults line dance at Mather's More than a Cafe in Chatham. The cafe, which caters to older adults but is open to all ages, serves affordable, healthy food and pay-as-you-go fitness classes (Photo: Pat Nabong). Older adults in their 70s and 80s gather in the lobby of New Pisgah Haven Homes every Thursday morning. The low-income senior building in Auburn Gresham provides a necessary service, run by residents for residents: a communal trip to the grocery store. On a sunny day in June, four of these older adults sit on the couch chatting while waiting for others to join them, and after 20 minutes, they board a small white vehicle that resembles a school bus. Carlton Brown, 72, is the volunteer designated driver this morning. He lets his crutch lean on the railing. His neighbors sit in the back with their walkers and collapsible grocery carts. Some days, Brown takes them in his car and they go to the doctor's office. Sometimes he drives them to restaurants and shopping malls. Other times, Brown visits people in the building who can't get out of their apartments. When Brown doesn't need to shop for food at the grocery store himself, he keeps an eye on his neighbors as they scan the aisles. "Some peoples can't get out to do what they need to do. Some don't have the means to get there," said Brown, who's been living at New Pisgah Haven Homes for 11 years. He anticipates that one day he may need help too, in the same way that he helps his neighbors. "Right now I don't [need assistance], so I make myself useful while I can. . . . If you live in a building like this, it's what they call a congregation, a peoples that are around together, and you have to learn how to live that way." 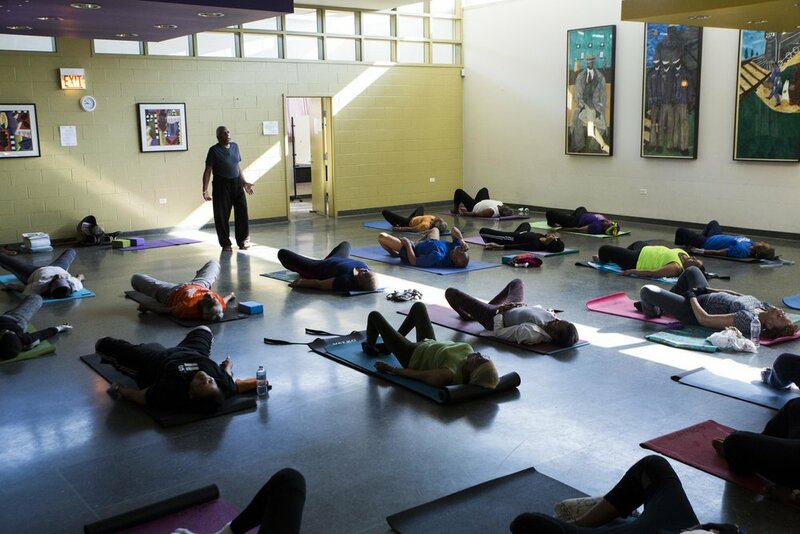 Yoga teacher Tony Stevens, who lives in Calumet Heights, used to serve as a caregiver for several people in his family who were sick. Now, he is committed to living a healthy lifestyle. Older adults attend a free yoga class taught by Tony Stevens in the senior satellite in Abbott Park in Roseland. On Father’s Day, Carlton Brown, 72, waits for a table while his 13-year-old daughter has her eyes glued to her phone. “It is challenging to keep up with technology and the changing system,” said Brown. Often, he feels like he is “on the outside looking in.” “We don’t quite understand the system that they have today and most of us get left out of the things that we qualify for because we don’t know and that’s a big issue [in the] medical field,” he said. Marcia Cozzi, center, stretches with other members of the Chicago Hyde Park Village during their bi-monthly drop-in where seniors can exercise and interact with other community members over lunch. The village was formed to help members remain active and involved in their community. Susan Alitto, one of the founding members of the Chicago Hyde Park Village, an organization that aims to keep older adults involved in the community and battle loneliness. The view from Darnetta Donegan’s apartment in a low-income senior building in Washington Park. 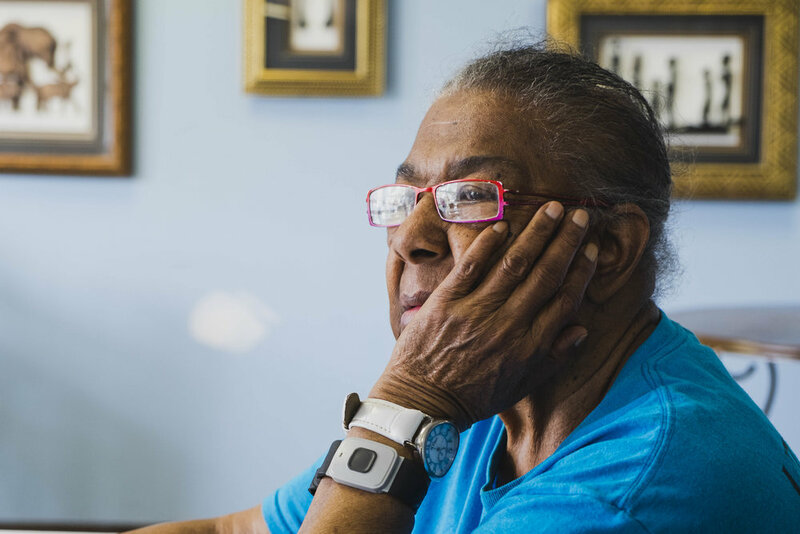 Della Freeman, 91, lives alone in a senior building in Auburn Gresham. “I always like to do things for myself,” said Freeman, who declined when she was offered a free homemaker to help her with chores. “I do all of my cleaning, cooking, and going around like that for myself…That’s exercise for me,” said Freeman. She wears a device that she can press whenever she has an emergency. It sends an alert to staff in the building. Dianne Hodges, 69, shops at the Whole Foods in South Loop. Hodges, who lives in South Shore, said there are not enough resources in her neighborhood that keep older adults healthy. “I never shopped in the community anyway because they had a Dominick’s here for years and I never really shopped [there] because [it] was so different from the North Side…but I understood why it was different because it’s not, they would try to bring in organic vegetables and things like that and they would just rot because the people were not, you know, were not buying them.” Hodges, who teaches meditation and belly dancing, had a mini stroke and since then, she has “had to work to reverse some things that would have caused me to be like most elders in my age group” through a healthy diet and lifestyle. 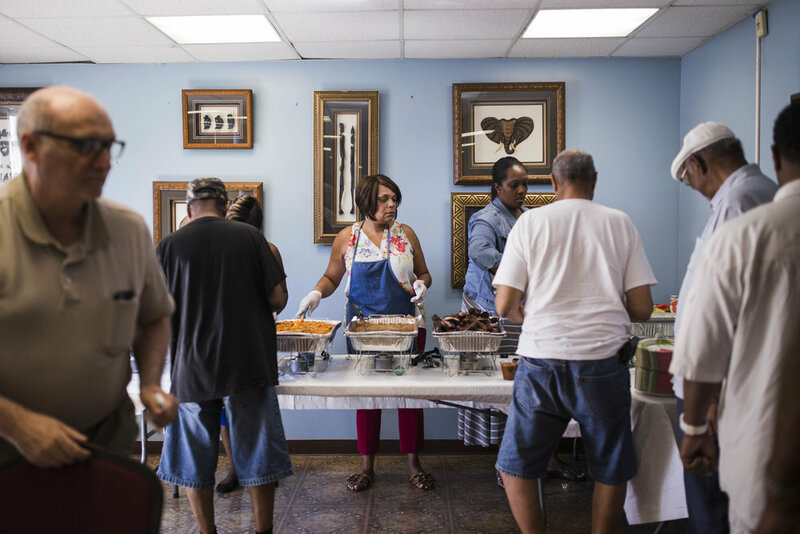 Becky Clark, service coordinator of New Pisgah Haven Homes in Auburn Gresham, serves food during the senior building’s Father’s Day Cookout. “They kids, they’re all busy. Every now and then you see them and then you don’t,” said Carlton Brown, 72. Because of this, many residents look to Clark for support. “[Becky] did a lot for me and the people here,” said Joe Boyd, 82. Brown wishes there were more people like her who can explain “all the ins and outs of being a senior,” like healthcare. A portrait of Joseph Hardy, 69, who used to live in a house with his sister, where he often heard sirens and saw people loitering. “As a senior, I can’t deal with that and you know seniors are more prone to be held up or killed.” Now, he lives alone in a senior building in Washington Park, which he said is a “pretty decent neighborhood.” He is still cautious and is part of the Telephone Tree program, which involves older adults who spend a lot of time at home and look out their window. When they see something suspicious, they call one another and all call the police. “The more calls to the police department, they will respond…if you have on for two calls going to them, they’re not going to respond,” said Hardy. Jerry Gripshover and Sam Guard leave a tip at Piccolo Mondo in Hyde Park. Gripshover and Guard are part of a men’s group composed of Hyde Park residents that meet at least twice a month to socialize. Social isolation among older adults is one of their biggest concerns. Rashid C., 72, used to live in a senior building at 42nd and Cottage Grove, which according to him, was infested with rats, bed bugs and cockroaches. Now he lives in Washington Park, a few blocks away from where he was born. He says the neighborhood changed a lot during his lifetime. “They didn’t have this many vacant lots and stuff. All these were buildings and different stores. The [money’s] going right out the community whereas before they had a black store, a black shoe shine shop, a black cleaners, a black everything but now all these other nationalities own businesses in our communities…it’s really the government’s fault that we’re in the situation we’re in as black people, really. They don’t really reach out to the black community. I mean, we got food deserts around here. 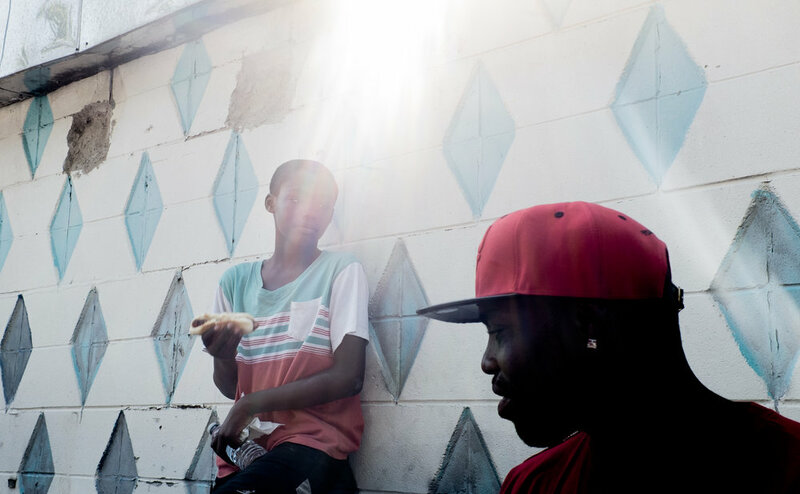 I’m fortunate to have a car but if you don’t have a car, I don’t know where you would go shopping here.” Rashid, who is a former drug user and spent his life “in and out of prison,” maintains a healthy lifestyle and plant-based diet. He said he had a “spiritual awakening” when he overdosed and someone found him passed out in the middle of the street. 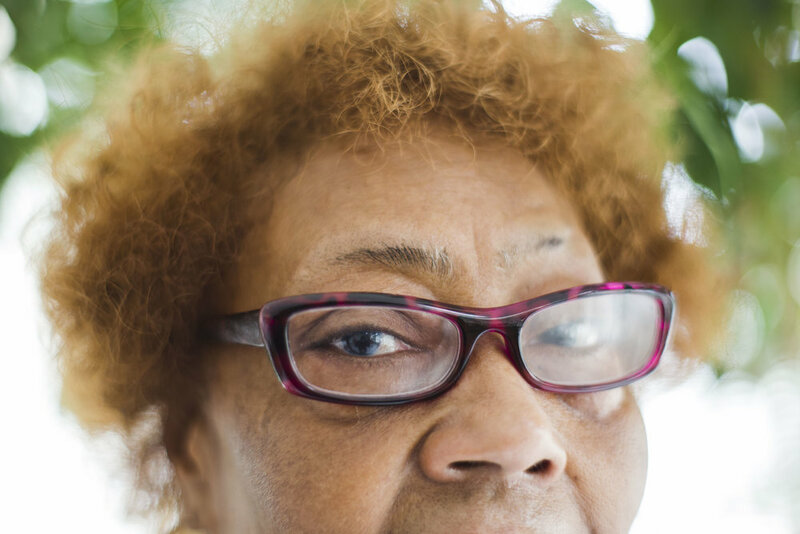 For many older adults who live alone on the south side, being part of a community, remaining active, and having people to rely on are not just important—they're necessary to their everyday needs and their overall health and well-being. Access to health care on the south side looks starkly different from that of other areas in Chicago. According to the University of Chicago, it's one of the most medically underserved communities in the U.S. Lack of access to health care is particularly magnified among the elderly. "Isolation is more than just being alone. It's being at risk," said Debra Thompson, chairperson of Age Friendly Englewood Village, a nonprofit that visits isolated seniors, organizes porch parties for them, and helps them with everyday tasks. "We have to get out and socialize with people. That's why we send our kids to day care for socialization," she added. "It don't only take a village to raise a kid. It takes a village to raise a senior." But not all older adults have people they can rely on, or the ability to participate in activities. Social isolation is a common concern among older adults on the south side, said Dr. Katherine Thompson, program director for the South Side Healthy Aging Resource Experts (SHARE) Network and a geriatrician at the University of Chicago's Outpatient Senior Health Center in South Shore. Studies show this goes beyond loneliness—social isolation among older adults can be linked to depression, diabetes, hypertension, arthritis, and coronary disease, among others, according to a report from the American Association of Retired Persons. "The people who age well have some kind of purpose in their lives or something that brings them meaning, and they tend to be people who have been able to stay active," said Thompson. 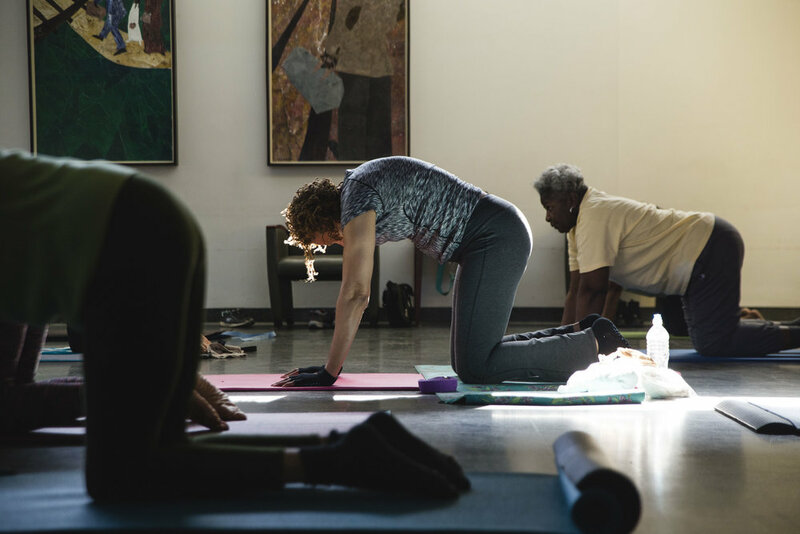 Many older adults who live alone find that sense of belonging in their neighbors, their home-care workers, or their yoga classmates. Some find it at the local senior center, at church, or even in line dancing class. Many say that being involved in different activities has made them happier and healthier. 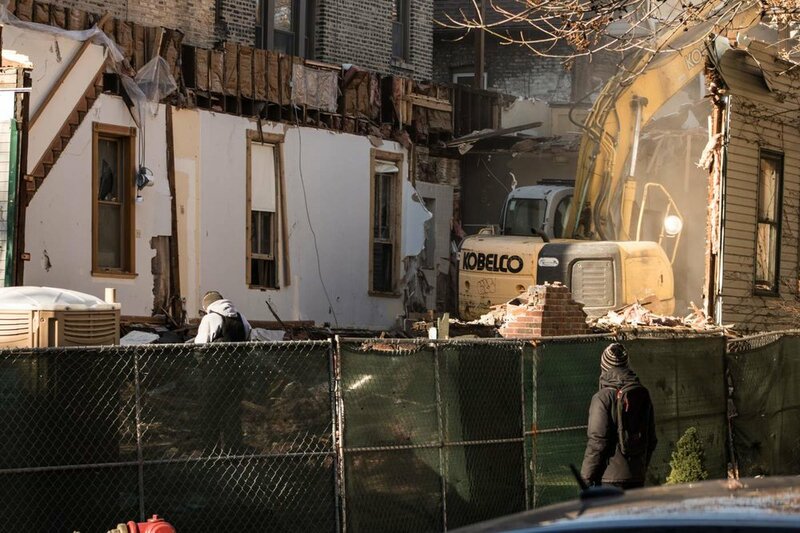 Eva Early, 73, who lives alone in the same Auburn Gresham building as Brown, said she was reluctant to move out of her apartment in Englewood and into a senior building. But she's come to enjoy weekly activities like Hawaiian luau-themed cookouts, field trips to museums and gardens, and health-related discussions. Early said she seldom sees her family these days, but when she gets bored or lonely, she goes to the building's common room to talk to other residents, who have become a second family to her. "It's like a little community, and I like that. They look out for you. We don't see you for a while, [we] check up on you," she said. "This is home. This is where I was supposed to be." This report was produced in partnership with the Chicago Reader. Special Training For School Police: How Do Young People Feel About It? 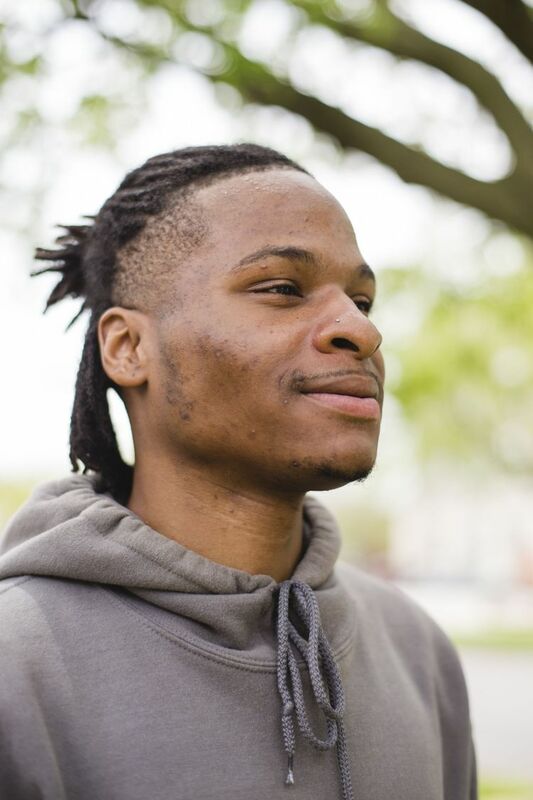 As lawmakers move to require additional training for police in Illinois schools, five young people weigh in on whether it will make a difference. By Jeremy Borden, Olivia Cunningham, and Alex Y. Ding. Photos by Pat Nabong. Legislation that would require specialized training for all school resource officers or police officers permanently stationed in Illinois schools now awaits Gov. Bruce Rauner's signature as the Senate-approved bill passed the state House Friday. The training curriculum would include conflict resolution and crisis intervention techniques specifically designed to address working with youth. The House vote on SB 2925, the Safe Students, Trained Officers Bill, comes a week after the latest mass school shooting in Santa Fe, Texas, and as the nation continues to grapple with school safety issues. Young people across the country have been weighing in, and one of the things they’ve been discussing is whether police belong in schools at all. In Chicago, where police officers already patrol many of the city’s public schools and often play a disciplinary role, the issue has had a different focus — less on the numbers of officers and more on the relationship between police and students, as well as the implications of police training. Nearly everyone that works with youth in Chicago Public Schools — teachers, social workers, school counselors, principals — undergoes specialized training. But until this recent legislation, this hasn’t been required for police officers assigned to work in schools. 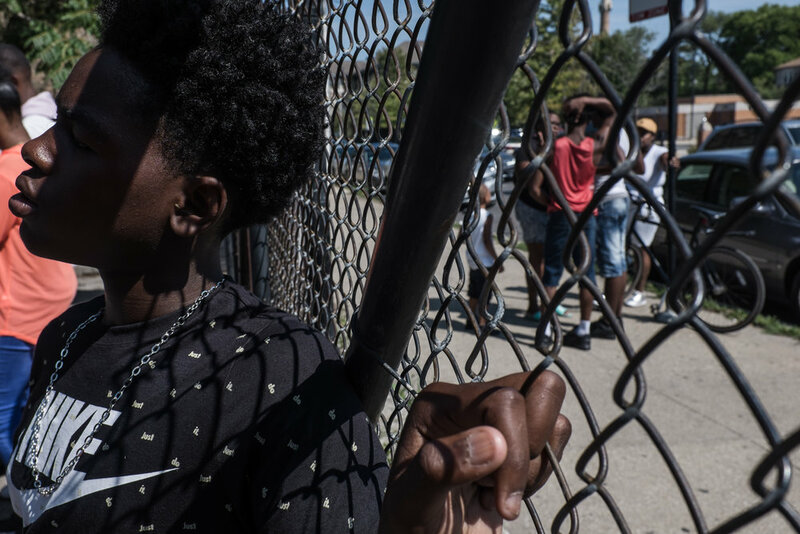 How should police assigned to Chicago Public Schools be trained to work with youth? Even as lawmakers push for the training bill, the debate continues on what that training should look like, who will pay for it, how it will be implemented — and whether police should patrol school hallways at all. We wanted to understand what young people in Chicago think, so we asked current students and recent graduates about their experiences with officers at school. Though the students we spoke with all felt that police shouldn’t be in schools at all, they told us that if officers are going to be present, more training could improve relations between police and students. Their interviews have been edited for space and clarity. What experiences have shaped your views on the role of police in schools? When I was a student at Perspectives High School, my cousin got arrested because they thought he stole a girl’s phone. The police came upstairs, they handcuffed him and roughed him up. They slammed him on the lockers. The police room in that school is this small room with no windows and just two police desks. That’s their headquarter room, like a holding room. He couldn’t leave — and it’s real hot in there. They held my cousin in that room for four hours. He couldn’t get food or water. They don’t tell your parents when you’re arrested or detained. They don’t tell you why you get arrested half the time. We knew this time, because they stopped the whole class to find the phone. He really didn’t have the phone. They never apologized. They were just really aggressive with him. They kept calling him boy or n-----. He has a name. His name is DaShawn. If you could design a training curriculum for police in schools, what would it include? If the police learned how to do restorative work with my cousin, they could have stopped the whole class, like, “Is there someone in this room who stole the phone? Why would you steal the phone? Do you need something?” That’s what they’re lacking — the ability to help. People usually steal because they need something. 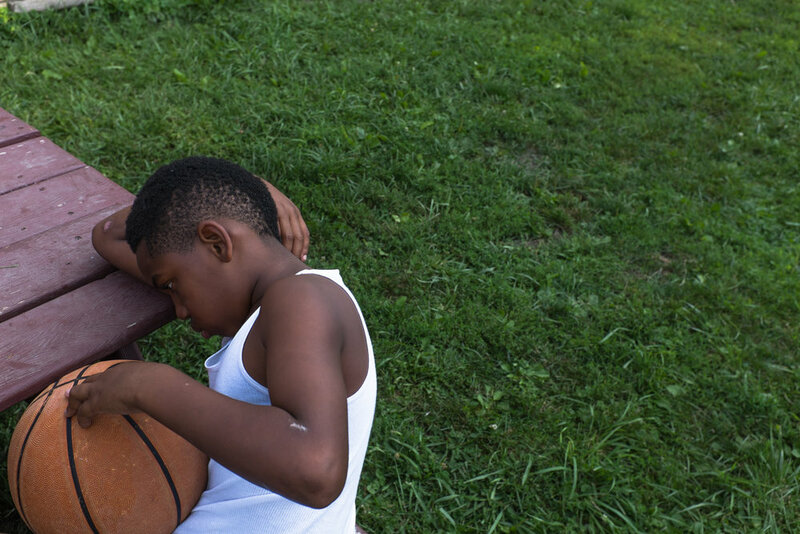 The police need training on how to work with kids who are experiencing trauma. You never know what’s happened. Somebody could have just lost they brother last night or they mother. They might just need someone to give them a hug, not pull a weapon on them. What do you wish police knew about you? Police need to learn who students are. You need to know their names. You need to learn their favorite colors. You need to know who their parents are when they come up for their report cards. You need to know all that. They need to know them inside and out. I see my guardian was standing there when they pulled me to the main office. I found out that she sent the police up to the school to have me arrested. She made up a whole bunch of things saying I tried to attack her, assault her, stuff like that, but it wasn’t true. So I was arrested that day, and it was about the first month of high school. I had interacted with the police before that, outside of school, but this really added to my trust issues because I thought that school’s the one place where I can be myself and be safe and protected. Most of my interactions with police officers is something where it feels like I’m not being heard and they’re just looking past me and just trying to shrug me to the side. Maybe they’re looking at me that way differently because I’m a woman, or I’m young, or I’m black. But just because I’m all these things doesn’t mean I’m a troublemaker. I’m not somebody that’s trying to look for trouble, although I can give off that image. I’m just kind of serious. If you just say, “Hey, you just shouldn’t do this,” I’ll respect that. I want to respect your personal space and I don’t wanna make anybody uncomfortable. You know, I’m a good kid, and my mom and my dad raised me to be better — not to cause problems. Should police be in schools? Yes and no. I get why you need them, especially in the news, you know, there’s school shooters and now [schools] are getting threats. And in that sense, I get why it would give you more security. But at the same time, I feel that creates a little distrust with the students because a lot of people might not have had the best interactions with police officers. So I get it, but at the same time I have mixed feelings about it. 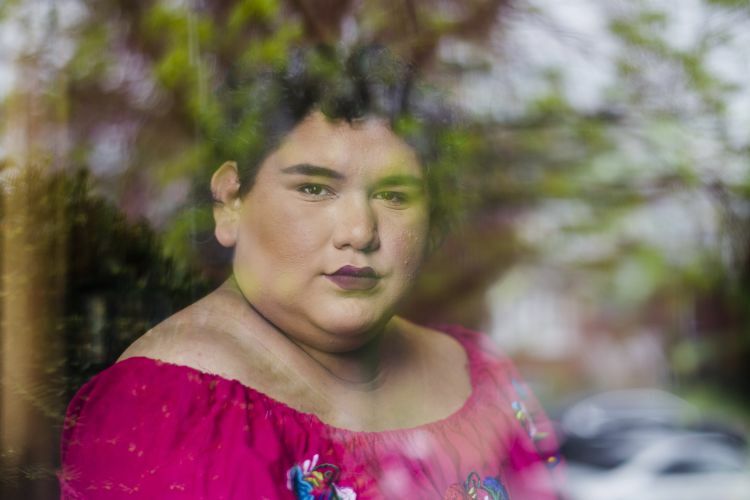 For me, being a trans woman, there’s a lot of stigma. My trans sisters are scared that one day they’re gonna be stopped by police officers and they’re gonna get misgendered and they’re gonna be harassed. I think I would not only want police officers to understand that every trans individual is different, but I would also ask for more training around that because that’s what the majority of trans women that I speak with are dealing with right now. In my eighth-grade school year, I was very mentally and emotionally traumatized, going through a lot at home. Traveling from house to house and worrying about whether or not I was going to have a roof over my head at the age of 13, 14. I went to school one day and I couldn’t focus on schoolwork so I got permission from a teacher to go to my counselor. As I was walking through the halls, a school resource officer was there and he thought I was cutting class so he started to follow me through the halls. And once he caught up to me, he wrestled me to the ground. And next thing I know, I’m being handcuffed and taken out. It looked like the whole police department was outside for one student, and I was later suspended for two weeks and expelled for the rest of my eighth-grade school year. If you could spend money on something to make school safer, what would you spend it on? We’re living in a time where art and music is booming and students are really interested in those types of programs and support systems that will set these kids up for the future. I know there’s a lot of schools on the South and West sides that do not have art class, do not have a music class, and don’t have a librarian in their library. When they don’t have those types of programs in schools, they look for a support system outside of school, and that goes to gangs and other bad things. So when they don’t have the support system at home or school? They take a very bad, negative route. This report was produced in partnership with WBEZ Curious City. Students joined the National School Walkout as a way to show solidarity for Stoneman Douglas while also remembering classmates and friends who were lost to gun violence. Tilden Career Community Academy students gather around the school’s “peace pole” April 20 for the National School Walkout. Photo by Samuel Davis. Quarntaz Thomas held the memory of his classmate and friend, Kejuan Thomas, close to him as he stood outside Tilden Career Community Academy last month for the National School Walkout. Kejuan was shot and killed on a summer afternoon at a Bradley Park basketball court last year. He was only 16. His death had an impact on Quarntaz, who decided to join a group of Tilden students for the demonstration. Quartaz found his answers in civics class, where teacher Samuel Davis encouraged him and his peers to stay informed and engaged in political and social issues that resonate with them. Davis also remembered Kejuan, who he taught as a freshman, as a “bright kid” who he looked forward to teaching again. As a teacher and a father of three young children, Davis struggled with grief after Kejuan’s death and recalled breaking down during his funeral. “I just wasn’t prepared for it,” he said about attending and speaking at the service. When the school year began, Davis saw his students still mourning and began to use his civics class as a way to offer support and let them all know they weren’t going through that experience alone. He wanted to “help show [them] a positive way” and give them a space where they could talk and listen to each other. Davis knew all too well what his students were going through. 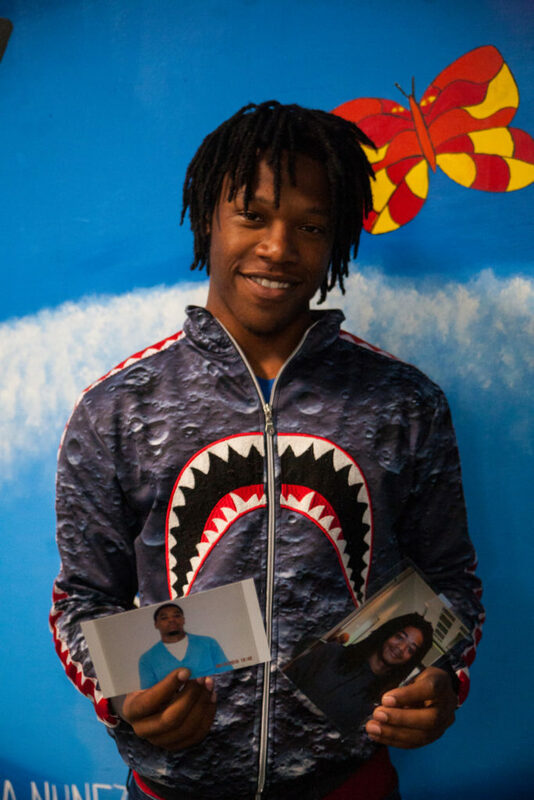 Aside from losing Kejuan, he lost two of his cousins, who were both in their 20s, to gun violence on separate occasions. One of them was murdered on his aunt’s porch in 2009, he said. Quarntaz partnered with the 17-year-old Fuentes to plan the April 20 walkout, which was part of the nationwide student-led movement that demanded gun reform. Thousands of young people across America marched in memory of the Marjory Stoneman Douglas High School mass shooting in February and marked the 19th anniversary of the Columbine massacre. That Friday morning, he and Fuentes met staff and students at the school’s “peace pole,” where they offered a moment of silence for those who lost their lives to gun violence. Tilden’s principal, Maurice Swinney, applauded his students for their participation. At the end of the day, he called his students into the auditorium and “celebrated their choice” to be a part of the national movement. Beyond that, he spoke to them about how important it was to build relationships with and be respectful to each other. Quarntaz and Fuentes took pride in seeing how receptive Swinney, Davis and faculty members were to their protest. While the pair continue to bounce ideas on what initiatives to take on next with their classmates, they reflected on feeling a sense of empowerment and strength. 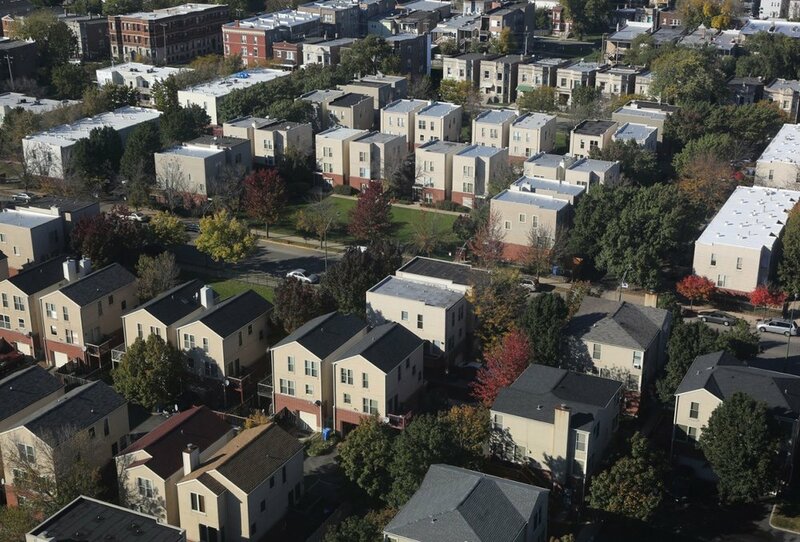 For many West African immigrants, neighborhoods like Chatham, South Chicago, and Bronzeville are becoming a home away from the North Side nucleus of the African immigrant community. Five West African immigrant business owners share how food is a bridge to preserve their culture and build new homes on Chicago’s South Side. Business isn’t just about selling food they love: they want to build community. “During the summertime, we are all out in the parking lot next to the restaurant grilling, playing Nigerian music and just making people feel comfortable in their own spaces,” explains Ade. But it wasn’t always that way. “When I was opening this business, I didn’t have a lot of money to start but I wanted to take a chance that the neighborhood would love our food,” Ade said. It seems to be working: now, most customers are locals looking for a taste of the African diaspora on a plate, he said. Nigerians make up the bulk of catering orders for naming ceremonies and birthdays, and they often visit for grilled suya, a spicy shish kebab, in the adjacent parking lot during the summer. With more and more West African families moving to the South Side, Mariam and Ade feel this growing community needs more unity. “Look at the journey from here to Africa. How can we migrate out here and not be together?” said Mariam. Southside African Restaurant, 8311 S. Baltimore Ave. Monday-Saturday, 10am-10pm. (872) 666-5588. Alioune Diagne is often on the phone bouncing between his native Wolof and French, taking orders for fresh baguettes. “French bread is very important for West African immigrants because of the influence France had during colonialism. It’s become a regular part of our diet, and for Malians, Senegalese, or Cote d’Ivoirians living on the South Side, my shop provides it fresh,” says Diagne as he hands a large fresh loaf to a Togolese customer at his African grocery on 79th Street. He says almost all his customers are West Africans living in the area looking for specialty items like Dutch Calvé mayonnaise. 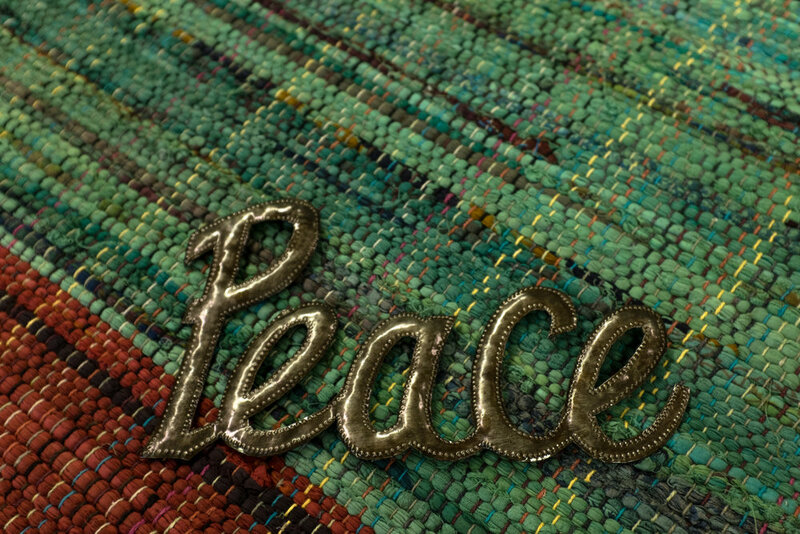 “It has this very particular taste that they are missing from home, and at the end of the day I’m in the business of selling items that make people feel like home,” says Diagne. His two-room shop is filled with popular items like dried baobab fruit, tangy gari flour, and dried hibiscus leaves. Mandela African Caribbean Grocery, 722 E. 79th St. Monday-Saturday, 9am-8:30pm. (773) 723-2111. “How do you tell if your yam is good?…You check the ends, feel for any brown soft spots, and cut into the middle to make sure they aren’t spoiled,” says Boyede Sobitan as he eyes a mound of leathery Ghana yams in the back corner of La Fruteria grocery in South Chicago. Yams aren’t cheap, and he only wants to select the best for OjaExpress, his grocery delivery app that specializes in African and Caribbean ingredients, largely sourcing from local shops like La Fruteria. It’s an endeavor Sobitan co-founded in 2015 to help African families find cherished food items like ground ogbono seeds or palm oil on the South Side. Coming from a Nigerian immigrant family himself, Sobitan grew up frequenting the city’s multicultural groceries that allow African families to prepare traditional food like egusi stew at home. Though these stores are a “happy place” for him, he says they aren’t always accessible for busy moms or professionals who don’t have time to drive to the far north or south of the city. With OjaExpress, Sobitan says the growing African and Caribbean population no longer has to scour the polar ends of the city for ingredients to make the dishes they love. Before Adama Ba opened Gorée Cuisine, his airy restaurant with honey-colored walls in Kenwood, he already served the Senegalese community as a tailor and clothing store owner. “Imagine fitted, elegant clothing in unique cuts with brilliant colors,” Ba says, referring to the Ankara maxi skirts and other contemporary Senegalese styles that he still sells at a storefront next to his new restaurant. Last December, Ba opened Gorée Cuisine, serving up bold dishes like chicken yassa and tiebu djenne, the national dish of Senegal made of rice, yams, cabbage and fish. His inspiration comes from his home on Gorée, a tiny forty-five-acre island just two miles from Dakar where roughly twenty million Africans were sold into slavery. The island, now popular as a pilgrimage site for diaspora tourists, was a natural bridge to Ba’s new life in Chicago. Our team of four City Bureau reporters (Martha Bayne, LaCreshia Birts, Darien Boyd, and Amber Nuñez Colon) is focusing this spring on the site of the former Northwest Incinerator and the neighborhoods surrounding it. We are intrigued that, despite the great deal of attention focused on the incinerator while it was active between 1971 and 1986, and its proximity to residential neighborhoods, community knowledge about this industrial site on the border of West Humboldt Park and Austin is so fractured. What it was once, what it is now, and what it could be in the future is, to many we spoke with, a source of mystery, confusion, or simply ancient history. This spring we're meeting with local groups and other stakeholders to explore not just the site itself, but what it means to shape future development, who gets that access, and how it might be expanded. To start off we'll share five things we've learned so far. When it opened, during the long tenure of Mayor Richard J. Daley, incineration of solid waste was believed to be an environmentally sound alternative to landfills, and the pollution-mitigating technology of the facility was state of the art for the time. But according to witness reports, the smoke from its chimneys often smelled extremely foul. Says Marie Henderson, longtime owner of Out of the Past Records at 4407 W. Madison, "I didn't notice when it shut down, I just noticed that the air got better." According to DePaul soil scientist James Montgomery, who visited the site in 1993, a visible layer of soot coated the ground and windows around the incinerator. A study by the Center For Neighborhood Technology reports that in 1994 the facility's smokestacks emitted 17 pounds of lead per hour, and a health screening in Austin at the time found that 1,638 children had elevated levels of lead in their blood. We are still seeking information about lead levels in the soil around the incinerator site, but soil testing in the neighborhood the early '90s showed levels of lead high above EPA standards of contamination. Whether the lead came from the incinerator or from, say, lead paint chipping off nearby houses, is not known. We do know that lead levels in water fountains at nearby Orr Academy High School tested at 16 percent above EPA action levels last year; water at some area parks has tested as high as 100 percent above action levels. Activists' hopes for the creation of a comprehensive recycling or composting facility on the site never came to fruition, though for a time the site was used as a sorting facility for the short-lived Blue Bag recycling program. Today the site is owned by the city, and used as a waste transfer station contracted to Marina Cartage. As recently as 2016 proposals were reportedly circulating among West Side business owners for possible mixed-use redevelopment at the site; the status of those plans is to date unknown. 5. It's sort of become a landmark. The incinerator building itself was demolished in 2015 (see above video), but its towering twin 250-foot chimneys remain a striking local landmark. Said one area business owner we spoke with, "Those chimneys just say 'West Side'." Share your memories of the Northwest Incinerator, and tell us what questions you want answered about its past, present and future: Text the word NORTHWEST to 312–697–1791. On June 8 from 6-8pm, we'll host a public event at Inspiration Kitchens, 3504 W Lake St, aimed at reimagining the Northwest Incinerator site through community input. Join us. This report was produced in partnership with Austin Weekly News.